HOUSTON (KTRK) -- Forty-seven years ago, all eyes were glued to the black and white images of man's first steps on the moon. In Houston especially, this day is remembered with great reverence. NASA film on the Apollo 11 mission, "NASA Apollo 11 For All Mankind." NASA did on July 20, 1969, what it was challenged to do eight years prior by President Kennedy: to put man on the moon before the decade was out. Its one of those moments when you remember where you were when it happened. "I was at home watching it on my tv because my shift was over," said Gene Hackemack. Gene Hackemack remembers that first step on the moon like it was yesterday. He was fresh out of the military, living in Alvin, part of the medical team that supported Apollo 11. He knew Neil Armstrong, Buzz Aldrin and Michael Collins. He did physicals on them. That first small step on the moon, he says he says was a catalyst for so many big things to come. "Baby steps. You know, one step at a time....it was an exciting time to be working there." After the moon, NASA shifted focus to lower Earth orbit - flying the space shuttle and building the International Space Station. Those who are students today will be tomorrow's astronauts - like the 30 students from around the country at Space Center Houston meeting those who have flown before. These teens are the next generation which NASA could someday put on mars. "A person can have a dream and see that dream be fulfilled," said Josef Sorrells, a 17 year old student from Dallas, who hopes one day to work in the aerospace industry. The space agency is working hard to re-invigorate a public quest for exploration beyond the horizon we have already seen. 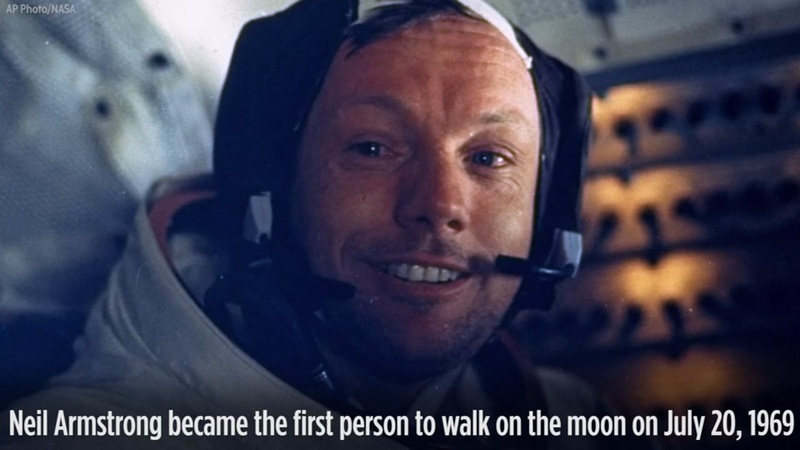 On July 20, 1969, Neil Armstrong set foot on the surface of the moon and changed the course of history. "Unfortunately its tapered off quite a bit and I think it's a moment to kind of re-energize that interest," said former astronaut, Michael Lopez-Alexander. NASA's first launch of its space launch system is set for 2018. It's still looking at going to a near-Earth asteroid by 2025 and to put man, or woman, on Mars by the 2030's.